Preface. Introduction: The Problem of Mass Schooling. Part I: Theory and Setting. Theories of the Emergence of Mass Schooling. Mass Schooling as the Ritual Construction of the Modern Citizens. Educational Development in Swedish History to the 19th Century. Part II: The Individual. Cultural Construction of the Individual: Religion, Literacy, and Law. Organizational Construction of the Individual: Economy, Politics, and the Military. Part III: The Polity. Formation of the Rationalizing National Polity. The Demise of Traditional Collectives. The Active State and the Progressive Polity after 1750. Part IV: Citizenship and Schooling. Citizenship and the Schooling Debate in the 19th Century. The Development of Swedish Mass Schooling, 1800-1882. Conclusion: Long-Term and Comparative Considerations. Notes. References. Index. 420 lit. refs. approx., 2 illus. Employing a macro-sociological perspective applicable to all Western countries, this book argues that mass schooling is an essentially ideological enterprise. Concentrating on the 1650-1850 period in Swedish history, the book traces the institutionalization of the universal, egalitarian individual and the homogeneous, integrated national polity as primordial social elements in place of the corporate groups of estate society. It then studies the reorganization of the Swedish polity as a secular project for the pursuit of progress under the direction of an active bureaucractic state. These transformations led to the ideology of mass schooling as a ceremonial means of preparing competent, responsible citizens who could participate successfully in the rationalized, exchange-oriented polity. 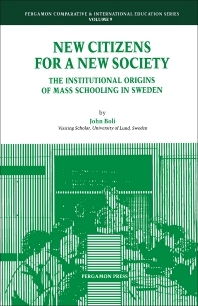 The book's detailed study of primary schooling between 1800 and 1880 supports this theory, demonstrating that competing theories - functionalist, social control, status competition, and modernization arguments - are contradicted by the Swedish primary schooling in the 20th century and speculates about future mass schooling developments. For Sociologists studying education/schooling, historians in this field, and sociologists and historians concerned with the general problems of the rise of the modern West, social change and the meaning of modernity. Visiting Scholar, University of Lund, Sweden.